When you think of butterflies, do you automatically go to butterflies in your stomach or think of the casual Monarch butterfly fluttering away in Summer time heat? If yes, I use to think exactly like you, but now I think a little bit differently ever since God beautifully captured the butterfly into my family’s life. Ever since God gave me this beautiful picture of love, grace, and wisdom. Once again, God took the simplicity of something like the butterfly and made me a firm believer of his God signs. He made me a firm believer he is still alive and whispers to all of us in different ways. My hope is after you read this post you not only see how the butterfly does a fly by in my family, but you start to see God signs in your own life. You begin to feel giddy just like you feel when butterflies are in your stomach. To be honest, it wasn’t until recently, where I was more than the average admirer when it came to the butterfly. Maybe I was even a bit childish as the butterfly was solely a childhood figure in my mind. Yes, the butterfly was beautiful and mysterious and there has never been a time I did not want to see a butterfly dipping and diving across the sky. Perhaps, I even liked how butterflies fit in fairy tales and sparkly stickers. Yet this was not the picture God was drawing for me. The butterfly was meant to be so much more! The sad part is God was painting this beautiful picture and it wasn’t until recently the lightbulb went off and I put two and two together. The first time the butterfly made an appearance was on a warm day in Mexico. We were at the Casa de La Esperanza orphanage talking with the two directors when suddenly we all stopped in awe. Right in front of us was this giant butterfly who flew right in between the two directors and my husband and I. This was the first time the butterfly drive by occurred, but now believe this will not be the last time. Just the other day, I was on the phone with our family friend Alan when a butterfly made an appearance by our sliding glass door. Alan, our friend from church, has been the survivor of many life beatings such as losing his parents at a young age, to getting in a horrific accident where he fell from a scaffold, to alcoholism, to losing his wife and child by a drunk driver, to being homeless. We were on the phone to pray and talk through the alcohol treatment program Alan was about to start. The program Alan hoped would help him give up the control alcohol has had on most of his life. Alan has always been a believer, but as excited as he was to start the program, he knew it was a tough road ahead as he has to battle his own demons, get to the core of his issues, find a path for his future, gain a new support system, embrace forgiveness, and give up anger, disappointment, and sadness. Right at the time where I was wondering whether I was saying the right words of compassion, wisdom, and God’s grace to Alan was when the butterfly flew by. Believe me, we don’t “Pay It Forward” because of seeing the butterfly (especially since we just realized we were seeing the butterfly at these special give back moments) or because we believe we will fall more into God’s grace because God can never love us more than he already does, but it is nice to know God is by my family’s side as we are living out our family’s mission of paying it forward. It is nice to know we don’t have to question what God wishes for all of us; which is to take care of our neighbors and the planet he has created. It is nice to know God wants to let us know he is real in our lives and not solely in old scriptures in a Bible. If you wonder if he is alive, think of your life and how he may be sending you signs. Perhaps, like me, it will take awhile and he will have to hit you over the head with the realization he is whispering to you or drawing you a beautiful picture, but be open to it. If you truly believe he has not given you any God signs, then I ask you to pray for a sign and like Doubting Thomas who didn’t believe Jesus had risen, God will show you what you need and want to see. It’s crazy how this works when you are open to it. For me, God gave our family the sign of the butterfly and quite frankly this gives me butterflies and goosebumps realizing my book series is called “Watts Bugging You”; which now does not seem to be a coincidence. My belief is everything God does he does it with all of his wisdom and never does it half heartedly. 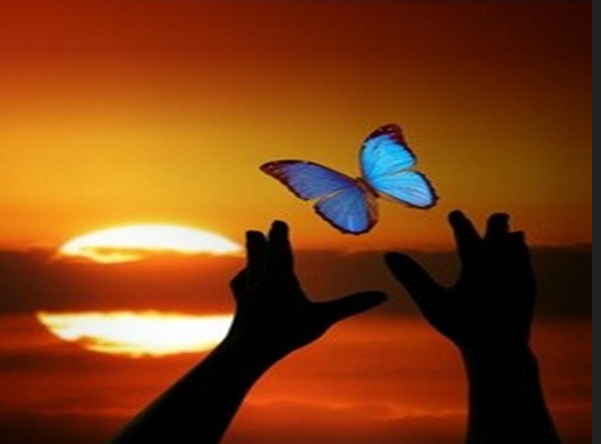 For me, the realization of God’s love, wisdom, grace and God signs are what gives me butterflies in my stomach. What about you?